We've been having the most mild Winter and it has honestly felt like Spring here lately, but unfortunately it looks like the colder wet weather is on it's way back. 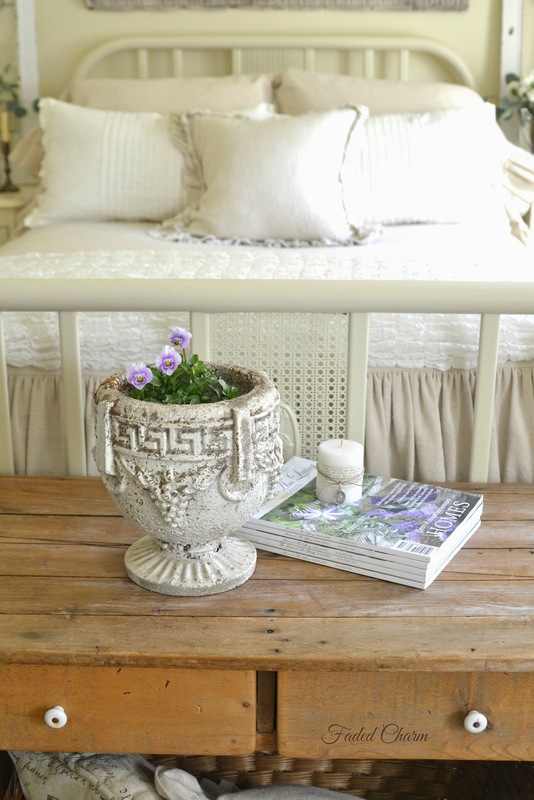 I always enjoy adding fresh flowers to my home this time of year and especially to my bedroom. 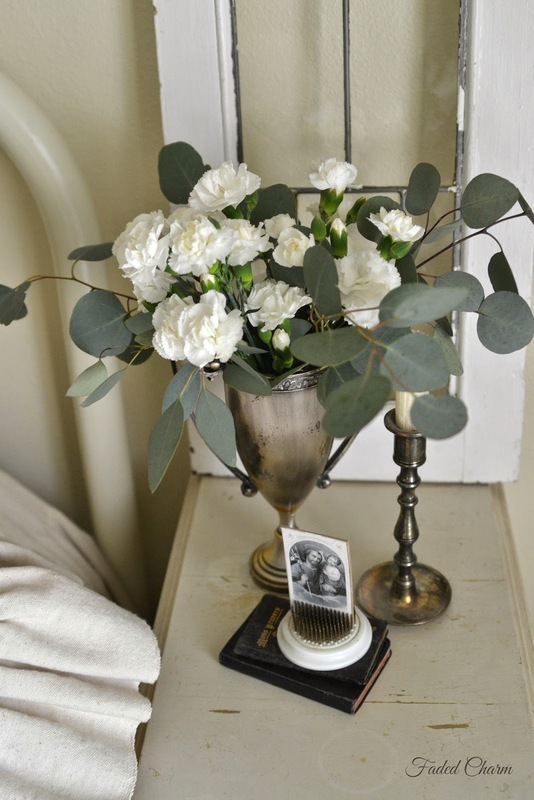 My favorite combination to add to the trophies on both nightstands is eucalyptus and carnations. 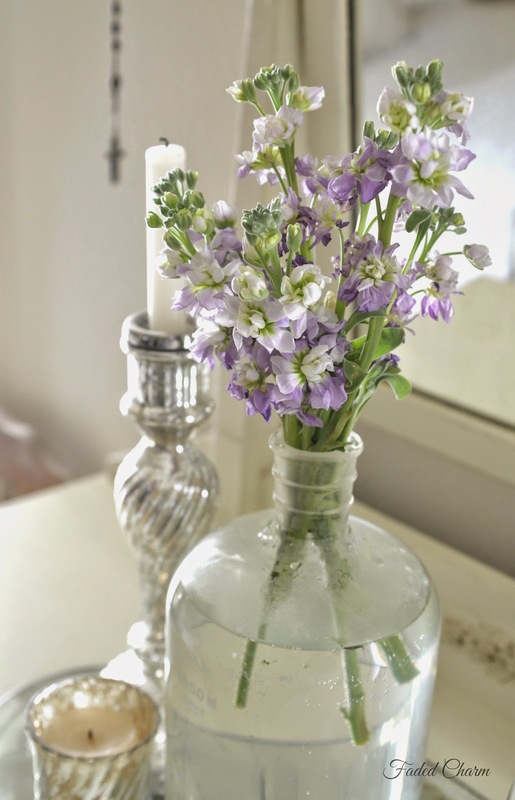 They not only smell wonderful together, but both will last quite a bit longer than most blooms. Enjoy! xoxo K.
The sun was shining so brightly a couple days ago and I quickly took some photos of my bedroom before it went away. 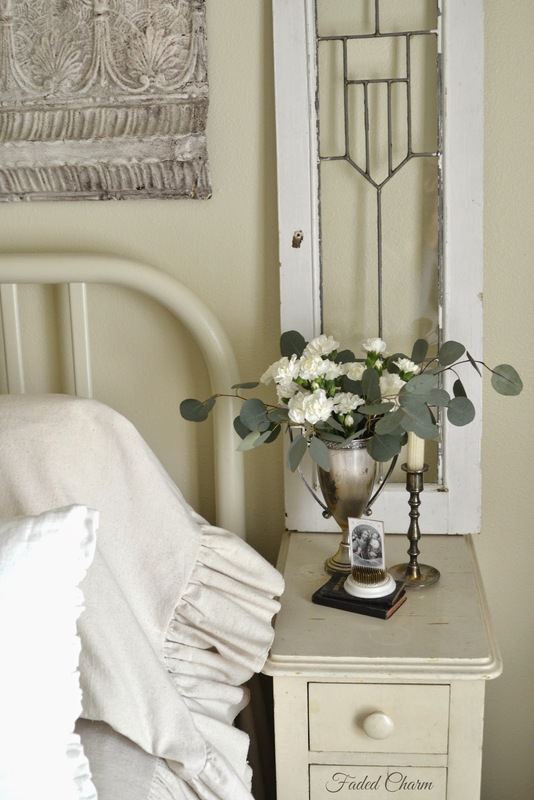 I replaced the shutters with the sconces on either side of the bed with these wonderful leaded glass windows I found which I thought looked better in here and also because I found an old candelabra light that I added to this corner, so I didn't need the lights above the bed any longer. I've been wanting to switch things up in my office and they will most likely end up in that room along with the mannequin that used to be in this corner. 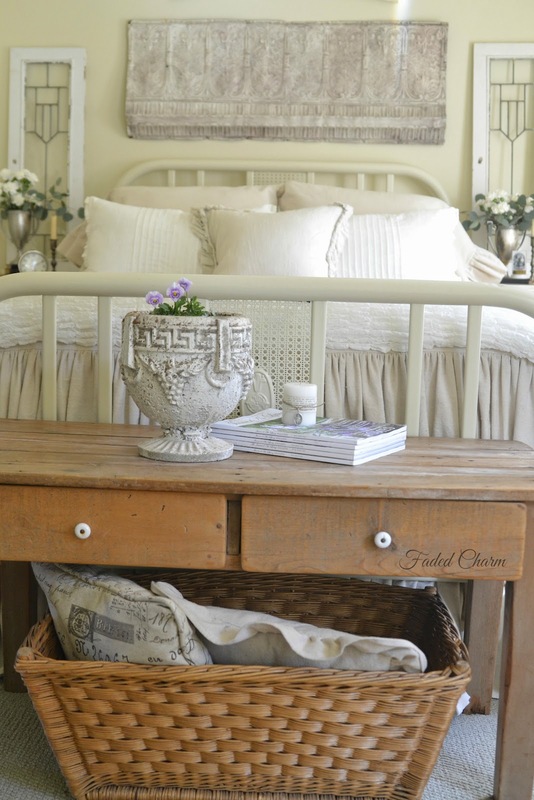 Right before Christmas I replaced the large French Wicker basket with this table at the end of the bed and used a smaller French basket to hold extra pillows and blankets. I had planned on selling this table, but the the patina is wonderful and it's a nice size for here or can be used as a coffee table down the road.....so, like many other items(which are just getting so hard to part with), this is going to be a keeper for a while! These pansies just make me smile:-) Enjoy your day! Well I just love everything about this space. Thanks for sharing. Such a beautiful little haven you have here! The sunlight makes it wonderful! Oh dear me....I am devouring this room. 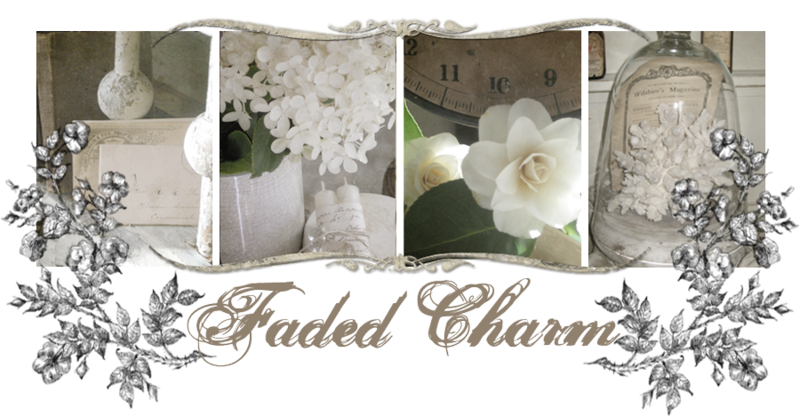 BECAUSE I am getting ready [ Spring ] to turn my bedroom into an ALLWHITE room I have wanted for some time now. Keeping in mind my allwhite means "Shades of White". 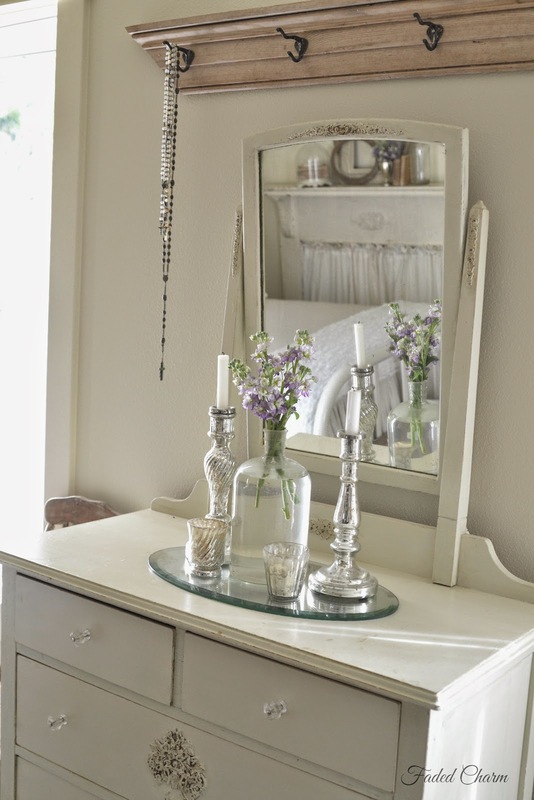 Your little skinny delightful bedside table must be a reconstruct from an old vanity..so perfect. You can see my initial planning post at LGH..even waaay south I still have to wait for weather changes. I expect to be referring back to your lovely room as I get started on mine. Yours has reminded me of some treasures tucked away overhead in storage.."windows" thanks for the fantastic post. Your bedroom looks so peaceful and inviting. I am so tired of the snow here and cannot wait for Spring to come. I love everything about your bedroom. 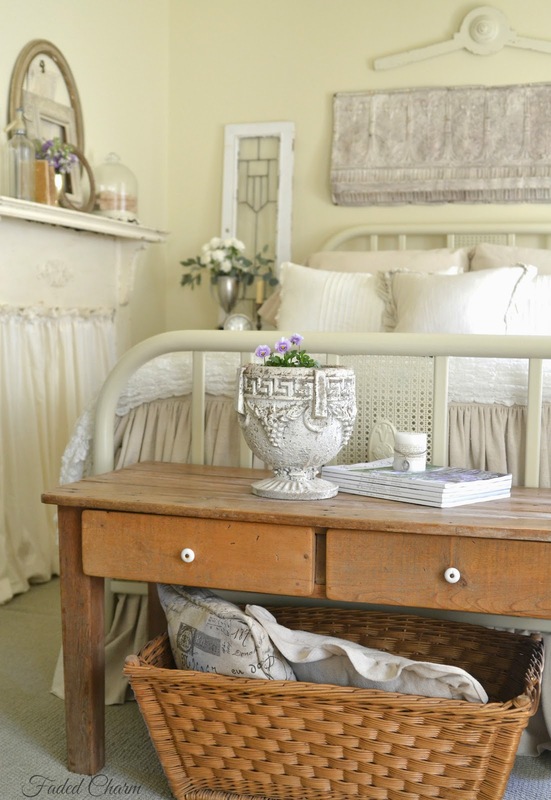 I especially love the little side tables. I don't think I've ever seen any this small. I really could have used these in my last house. I love the room. I have the same bed that I painted in black. Thanks for the table idea at the foot of the bed. I love the way it looks. That table is a definite keeper...love it...love your whole room! What a peaceful space. I'd say you just about have it perfect! 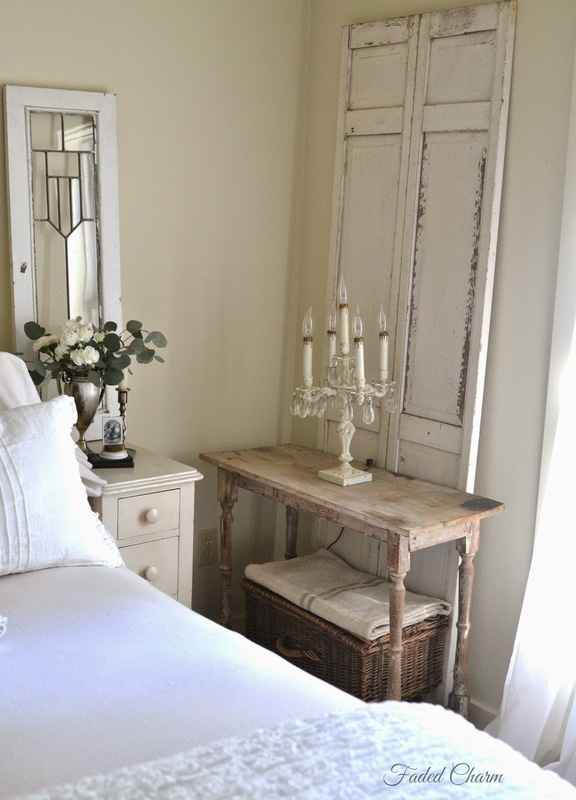 Lovely room, however, I would want a lamp (perhaps a floor lamp) tucked in beside the bed. I love to read in my bed at night. A wonderful way to relax me to sleep. Do you mean eucalyptus candles? Your room is so pretty. Thanks for sharing. beautiful Kathleen siempre me gusta todo tus arreglos se ve paz y tranquilidad !! 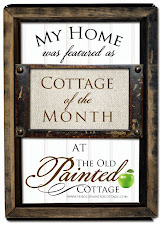 I used Elephants Tusk from Benjamin Moore which is a creamy white. 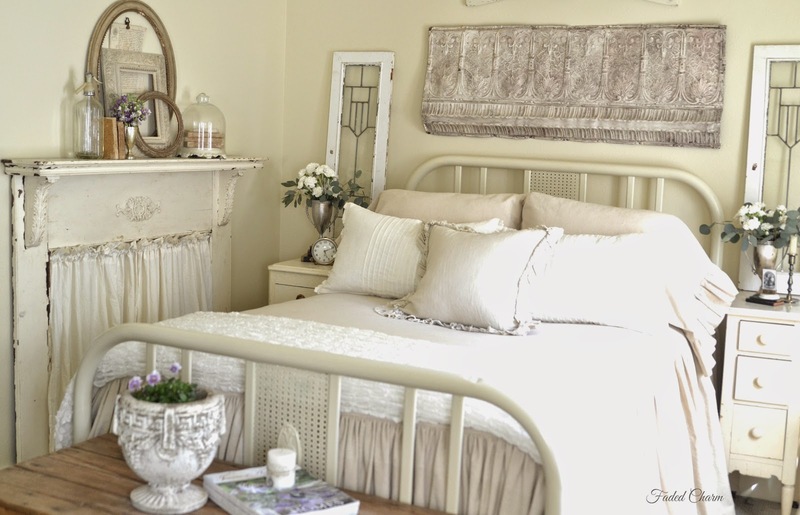 Your bedroom is so dreamy! I love everything in it! 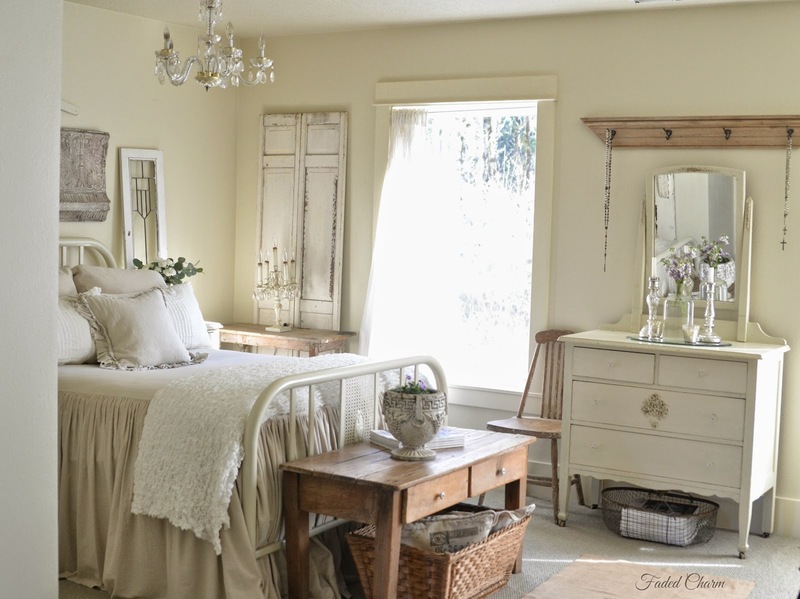 Love seeing your pretty bedroom with all the character of the old pieces. So beautiful. You find the best pieces Kathleen! 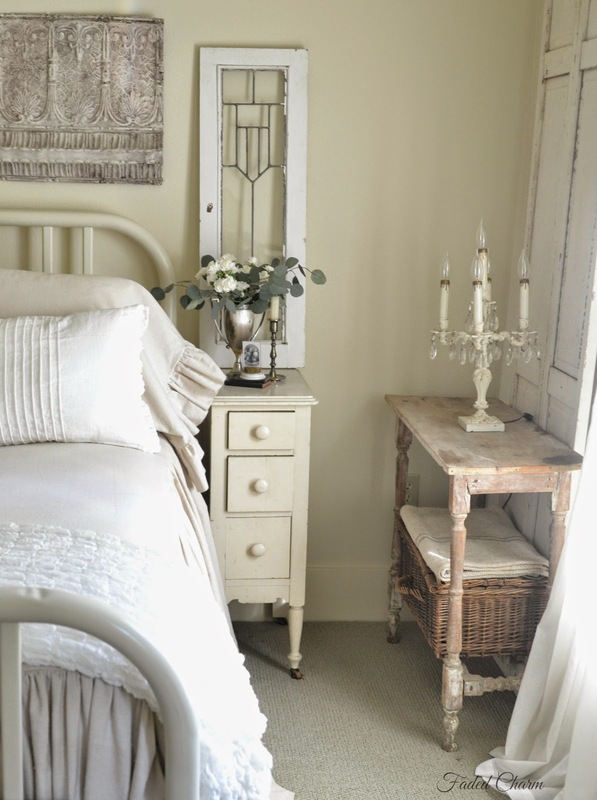 I love those leaded windows beside the bed! Oh Kathleen! I love your bedroom! The light in there is just ethereal! It all belongs in a magazine! I would ,ove to nave a bed spread like yours would you share where got it. beautiful!! where did you find the bedding? Yes, I'd love to know where the bedding came from! Beautiful room! I would love to know where the bedding is from as well, please! I purchased the bedspread and ruffled pillow shams from Ticking and Toile on Etsy. Nicely done! 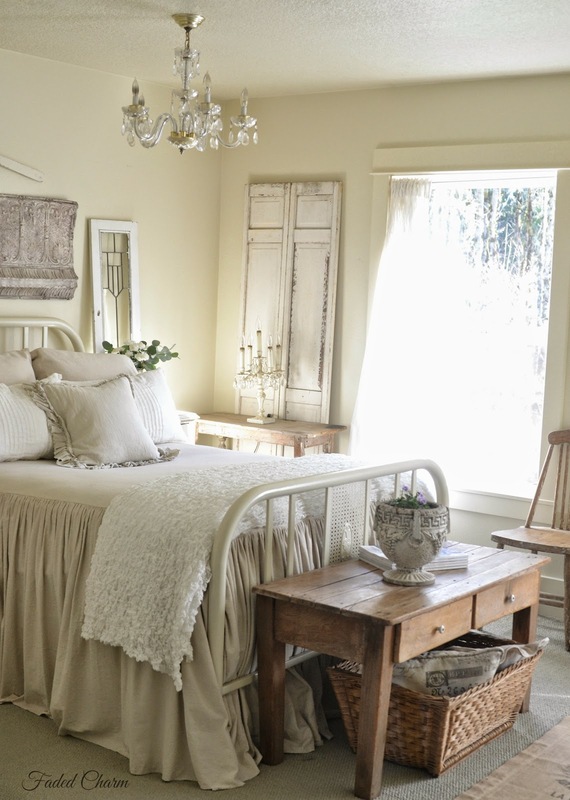 I love the use of the iron bed frame painted white. 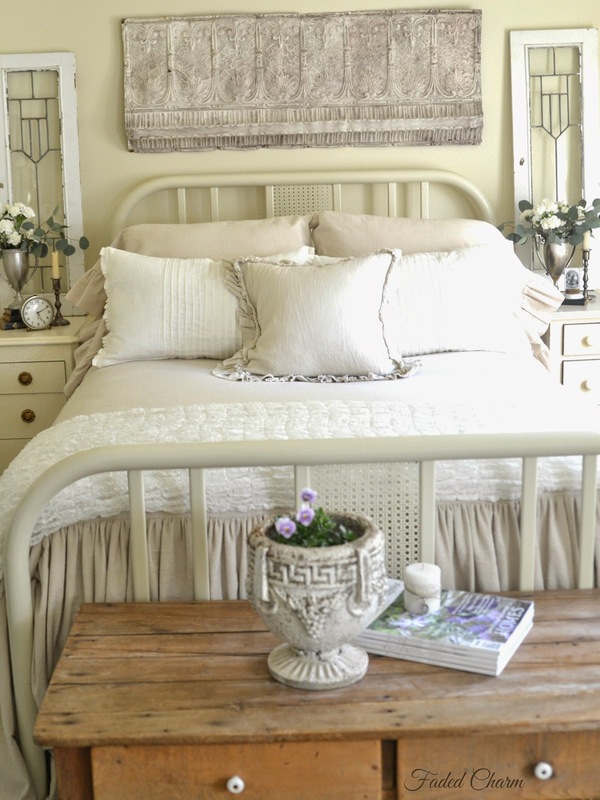 I actually just purchased that exact same bed frame from a friend who had found it in the basement of an old cottage she had bought. If you know anything about the piece such as the year it was made or how you acquired it, i would love to know. Where did you get the bed spread? 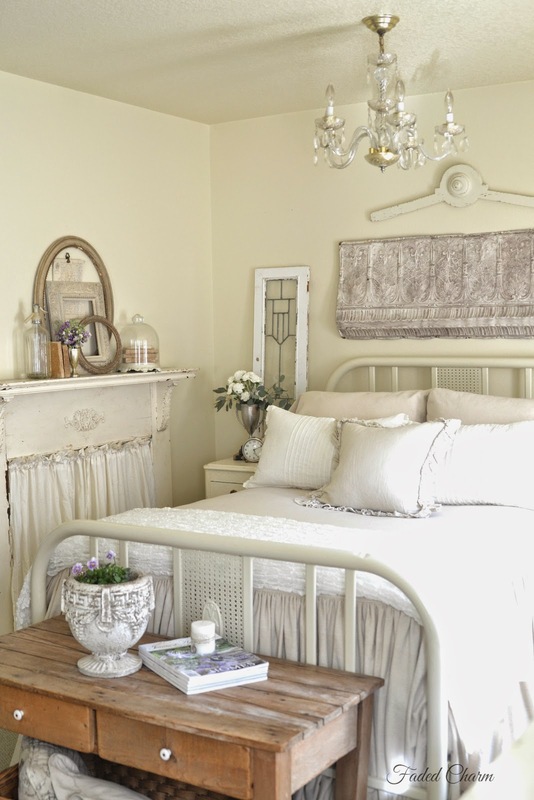 Shared here so many beautiful pictures of bedroom designing and decoration I really liked the bedding ideas, its too good. Thanks for sharing. athleen-- what a beautiful home! I was wondering where I might be able to find this bedspread? It is so lovely. believe me, I will do my bedroom almost the same!!!! Love it! thanks for sharing. I am looking at "Ticking and Toile's" Etsy account now. I am hoping to order this bedding. Any idea if you ordered the Shabby Chic Duvet Cover, or the French Prairie Coverlet? Also, what color - natural, oatmeal, off white? Thanks so much for your help! I've been in touch with them and they told me you got Distressed Canvas. It's strong and beautiful. They also do Daybed covers and that is what I am having her make first. Where did you get your bedding...I love it!! Your room is so pretty I love the shutters on the side of the bed. Beautiful room! Dying for a similar bed..where did you find yours? Would love to know the color of paint you used on the walls!